Zoomer Meowzies or Zoomer Kitty? Which one is your choice? Zoomer Meowzies or Zoomer Kitty? What is your choice? Maybe this is an old news for you, but for me, it is a new thing! I have never heard of Zoomer Meowzies or kinda similar version Zoomer Kitty. Until a few days ago. I was searching something on YouTube channel, and I came across a video about this toy. I started searching on the web to find out more about this toy. It looked so cool to me. But, when I came across to some customers reviews, there were a lot of different opinions about this toy. Some were very happy with it, some of them think that it is just ok, and some of them don’t like it at all. Without delay, let’s just start with reviews, and then you will decide for yourself. Characteristics of Zoomer Meowzies and Zoomer Kitty toys were taken from spinmaster.com. Zoomer Meowzies is a new collection of a cat-shaped toy. In this collection, you can find Zoomer Meowzie cats named Arista, Viola, Patches, and Lucky. These cats are just adorable! They come in different colors like purple, pink, blue, black and some more. And, they have a fluffy tail! 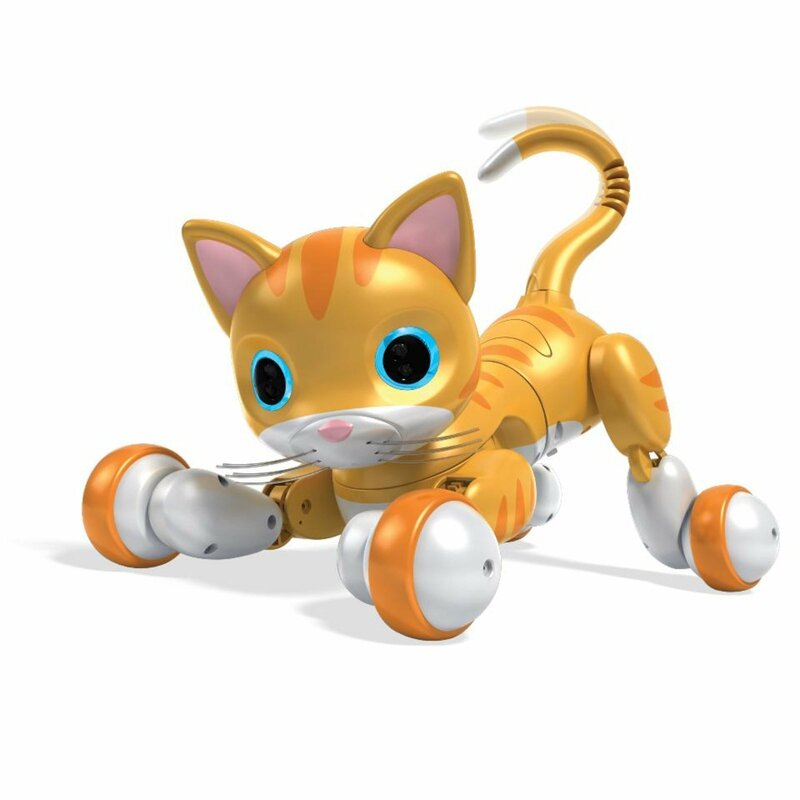 A great thing about this toy is its cuddling and playful nature.Also, Zoomer Meowzies will purr and send you cat kisses. It’s just like having a real cat! Except, it can’t move. Yes, costumes have complained about it. It is because Zoomer Kitty can (find out more in next paragraph). But, on the other hand, it really has some great features! As we already said, these toy cats have very cuddling and playful nature. In other words, more you cuddle them and play with them, they will be happier. But, how is that possible? Firstly, Zoomer Meowzies have a variety of games you can play. And the screen is set in this kitties eyes. You can play music, dice, meow hero, hot hands, mouse chase, guard mode and kitty match (this one is only available for “Patches” ). I think this is a very nice feature! Furthermore, these toys have sensors on her head, back, and chest. If you pet your Zoomer Meowzie, this sensors will activate. Also, when you pet it, its eyes will lighten up. Moreover, if you collect all Zoomer Meowzies, you will watch them share jokes, sing and share secrets. I was looking for customers reviews on Amazon and Spin Master. Scrolling through them I could see a lot of positive responses and happy customers. On the other hand, there were those who were not so happy with it. We could even say disappointed. Some of the complaints were that it was too small, that it is easy to get bored of it and that its game device is not so easy to use. But let’s not forget the fact that a lot of customers loved it. It has 4 out of 5 rating on Amazon. I, personally, like it. True, people usually buy it for kids, but who said “adults” can’t play with it? Another thing to consider is its price. It sells for about 30 dollars. For some, this could be too much. But, wait to see Zoomer Kitty. If you want to buy Zoomer Meowzies click here (blue), here (pink) or here (purple). Zoomer Kitty is a similar product as Zoomer Meowzies. An only additional feature is that it can walk! Zoomer Kitty will follow your movements. It’s just like having a real cat! But, it doesn’t have a game mode in her eyes. Instead of that, Zoomer Kitty can sing, dance and perform tricks. I don’t mind that. I’m sure its fun to watch! Furthermore, Zoomer Kitty also comes with cuddling mode. This toy also has sensors that activate when you cuddle it. The only thing different is that these sensors are in head, ears, and cheeks. And, same as Zoomer Meowzies, more you play and cuddle with it, this cat toy will be happier. Moreover, Zoomer Kitty comes with Kitty Toy. Because of that, having this toys is even more fun. It is important to mention that you can see how your Zoomer Kitty feels by the color of its eyes. Overall, looking at the customers’ reviews, I could see that the comments were better than the comments for Zoomer Meowzies. But, that doesn’t mean there are no bad reviews. This toy doesn’t come with batteries, but with charger. But, some customers pointed out that, even though it is fast and easy to charge (it takes about 30 mins), you have to charge it again after only 30 minutes of play. Also, some customers complained about sensors reach. If you want Zoomer Kitty to recognize you, you have to be at least 6 inches or even more close to it. And let’s not talk about the price! 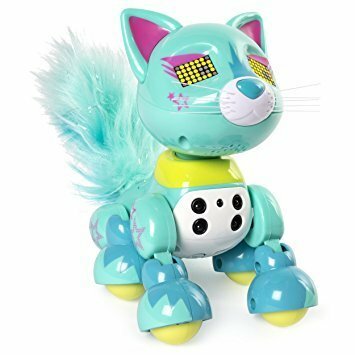 The price of Zoomer Kitty goes higher than 100 dollars. This toy sounds really great to me, but I don’t think it’s worth that much money. But, if you absolutely love it, you can find it here and here. Now that you found out more about Zoomer Meowzies and Zoomer Kitty, what do you think about it? Would you like to have it, or is it just too childish for you? And, what do you say about those prices? Some might think it’s over the top, but some might think it’s realistic. I mean, look at how many features does it have! I think that these toys are pretty great, but still not worth more than 100 dollars for sure. But, who am I to judge? If you like it, and if you think it’s worth paying that amount for Zoomer Meowzies or Zoomer Kitty, go for it!